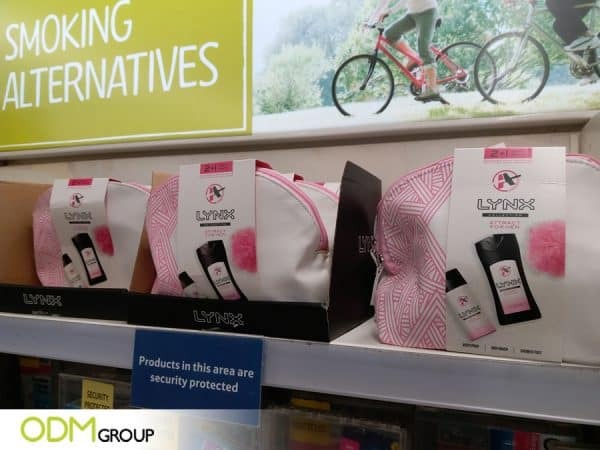 As part of their promotional activity, cosmetic brand Lynx, has created a wonderful marketing gift set for their avid customers. The gift set includes body spray, body wash, shower puff and a gift with purchase cosmetic pouch. Practical and affordable, Lynx’ “Attract Her” gift set is truly a fantastic promotional deal. The cosmetic pouch features simple yet functional design, perfect for the modern woman. Pink and white color combination looks dainty and neat. The gift with purchase pouch also served as a custom packaging for the body care products. Sells Product that Usually Go Together: Gift sets benefit both the business and the shoppers. Having all the needed items in one pack saves shoppers a trip down the grocery aisle. This way, they will not have to buy another separate item from another brand. Businesses greatly benefit from this tactic as this ensures that customers will buy 2 or 3 items from them in one transaction. More Value for Money: Getting four items in a single purchase appeals to customers. This gives the impression that customers can get multiple items at a discounted price. Moreover, the shower puff and the branded cosmetic pouch can be used long after the body wash and body spray have been consumed. Gift With Purchase Increases Perceived Value: The branded pouch bag is a fantastic giveaway for Lynx customers. It is ideal for travels and everyday use. Customers can use it to keep their bath essentials and cosmetics organized. With continued use, they will eventually associate your brand with practical and reliable products. Target Market- Understand your market and what they need. Brand It: Don’t forget to print your brand or logo on your promotional gifts. This will help you raise brand awareness more effectively. Speak with our Mindsparkz team for high-quality product and brand packaging design. A marketing gift set can help your brand in various ways- from developing brand awareness to driving sales up and building loyalty. So if you need help with your project, feel free to Contact ODM today. We will help create custom promotional merchandise and other branded marketing gifts. For marketing inspiration, check out the sample case studies below. Nutella’s on-pack personalize me gift pack allows customers to ersonalize the spread bottle with their own, thus encouraging customer-brand engagement. It adds fun and excitement to the promotion. This company promo idea is a great way to inspire brand loyalty. Make Your Money Worth with Promotional Gift Sets!